Earlier this month, we heard whispers rejected X Factor contestant Gamu Nhengu had recorded a charity single, which could hit shelves within weeks and even battle the X Factor winner for Christmas number one. Now the track has hit the airwaves, and we’ve got out hands on the very first sneak peek. SEE ALL THE LATETST X FACTOR PICTURES HERE! Earlier this year, judge Cheryl Cole caused controversy by axing Zimbabwean born Gamu – who has been battling officials over deportation and visa issues – before the X Factor live shows. But now the singer is back, and could soon be steaming up the charts with her brand new single. Gamu has teamed up with her ex-music teacher Dave Clifford for the festive track – entitled Where Will You Sleep This Christmas – recorded with the help of the Aberlour choir. And it seems the star jumped at the chance to record the special song. The charity produced the single on a shoestring, and were delighted to have a budding X Factor starlet in their midst. ‘We have had a long association with Gamu, who has sung at our Christmas concert for the past three years,’ a spokesperson for Aberlour revealed. And it seems the charity are thrilled with Gamu’s efforts. 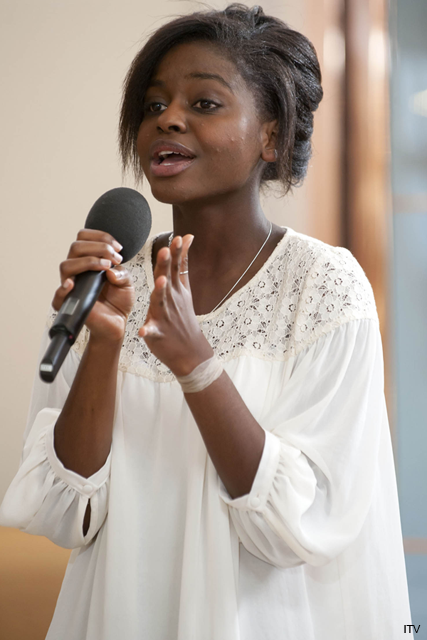 ‘Gamu has always had an amazing talent. Even when she did our Christmas concerts, she stunned the audience with the power and emotion in her voice,’ the spokesperson added. ‘We have always known she is a talented young person. The song is a good, strong one for Christmas. Gamu’s single hits shelves on December 13. Will you be first in line to buy Where Will You Sleep This Christmas? Let us know in the comments box below.